Community Spotlight: Sandra Schmidt | Brooklyn Running Co. 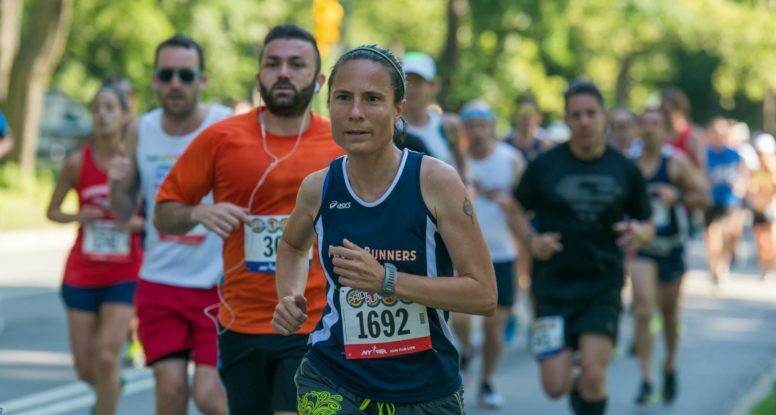 Given that June is Pride Month we felt it apropos to profile a member of Front Runners NY, an active running and multi-sport club for LGBT and LGBT-friendly athletes for more than 30 years. We’re very glad we did. I am an assistant professor at Teachers College, Columbia University. When not working and/or running, I lead Global Village trips for Habitat for Humanity, see the world through my camera, take my tent and running shoes to the woods, and play my bass or cello or listen to music. I largely travel either for work – research, professional development with teachers, or curriculum writing – or when I lead groups for learning or volunteering. 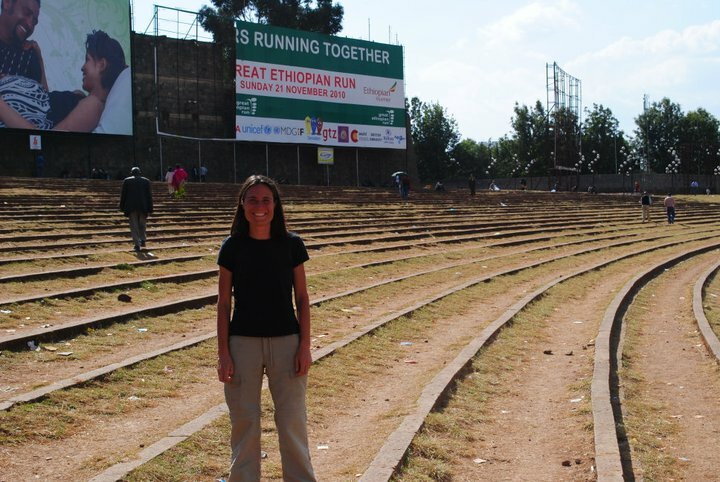 I have led 6 Habitat teams, one was to Ethiopia (note: see below photo of Sandra in Meskel Square, Addis Ababa where many great marathoners have spent time training). I will travel with teachers for community learning in Nicaragua next month. I find ways to run wherever I am. I find safety. I have run loops in a school compound when in challenging conditions in South Sudan and other times wander the countryside. I rarely travel to places where there is a significant running community. I have mostly spent time in East/Southern Africa and more recently in East and SE Asia. Even in Ethiopia and Kenya, the “real” runners train together in one area of the country. Thus, I run more to explore than with locals. That said, sometimes people join me for all or a portion. I have run with porters on Mount Mulanje in Malawi, and had a whole group I used to run with on an airstrip in another locale in (south) Sudan (this trip was before it was independent). But runs get me to marvelous places. Last summer alone, I was running along the oceanfront in Reykjavik, doing a 13 mile tour of the major sites of London the next, climbing Table Mountain/Lion’s Head in Cape Town to watch the sunset. And a few weeks later, a long run enabled me to see the east coast of Phuket and run up and around Big Buddha and back to my hotel on the west coast (just 25km). As an educator, I seek to expand how people think about and move in their worlds, particularly in thinking about justice, equity, and agency. I began running pretty seriously about 12 years ago as a doctoral student. I had a bike accident that largely prohibited my favored activity of the time – biking – and started running to stay fit. Running became an essential part of my life. It allowed me to get outdoors and breathe the air and seasonal aromas, it allowed me to explore and see new spaces in the city, and was a great way to clear my head. How long have you been with the Front Runners and what is their overall mission? I have been running with Front Runners since January 2013. FRNY states its mission as, “FRNY continues to be true to its original mission of providing a healthy athletic and social experience to the LGBT community. We are bigger and better than ever and hope you join us for a run soon!” I think this summarizes my experience. The club supports our racing through a great coaching staff. We have multiple supported runs each week that allow individuals to learn more about running and improve their times and distances, no matter their pace. There is also a great social support as runners. I also find political companionship with members of the club as we come together in support of LGBT equity. What are your current goals, both in terms of racing and for the social aspects involved with the club? Most importantly, to stay healthy and to enjoy running. Personally, I am working to break a 7-minute pace at all distances through a half marathon. Socially, I like to greet and encourage new members. I am committed to diversifying the club’s membership across gender, race, age, pace, class. What’s your favorite event to run during the year? My favorite event has to be our Pride Race! It is such a great celebration of running and queer community in NYC. Where is your favorite place to train in New York and what has attracted you to being a part of the club scene? I run all over the city. I think my favorite types of spaces are – any area with good hills, bridges (my favorites are the Williamsburg Bridge and the High Bridge), and all the great paths without cars. My favorite long run is to head across the GW and in what I call the Palisades Park in NJ. The route has a long bridge, lots of hills, is along a river, and has minimal cars.